BrixChicks chronicles our adventures in wine, food and travel from Alameda to Zagreb. Thanks for reading! The month of October was a slow month for blogging as I was out of the country with no vestige of my electronic leashes so, now I am trying to catch up. Since my September memories were apparently shot with a Vaseline coated lens (I think I might need ginko biloba!) I will just dish up the Reader's Digest version, since November looks action packed with new adventures that are circling like Arctic wolves, who know I have neither high powered rifle nor helicopter! First, I visited Viader in Napa and seriously recommend it if you are visiting. One of the prettiest spots in Napa. Lovely wines. A friend of a friend was reading tarot cards. He predicted we would love everything we tasted and we did! Also I attended the "Release the Spaniard" dinner at Twisted Oak. All I can say is that I fell into deep, enduring and mystical love with this wine! Beautiful, lush, spicy, complex. All in all stunning for a wine so young. If you met this wine on Match.com, he would be younger, richer and more colorful than his picture. A miracle in wine making. Check out what Sonadora and Farley have to say on the site. It's all deliciously true, Buttercup! Getting snarked at Waterbar. Waterbar in SF is pretty and food is good. It's pricey. Sadly not pricey in that way some restaurants have where you spend w-a-a-y too much and still feel like you got over. A b-day celebration with friend from college. We have a tradition of drinking a certain kind of wine, so I pay the corkage. Waiter far less than gracious. However Hope and Grace wine never fails! 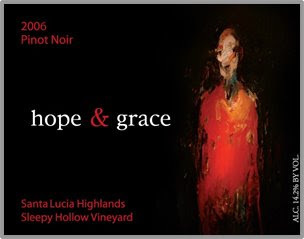 Our bottle was a 2003 Sleepy Hollow Santa Lucia Highlands. A transcendent example of California Pinot Noir. Juicy with berries, cherries, exotic peppercorns, sarsaparilla and all that is right with the world. Snark away Waterbar! Nothing on your wine list matches our traditional favorite. And no, just because the label looks faded and the bottle comes out of a handbag does it mean the two ladies eating at your fine establishment are calling it Miller time with a tasty malt beverage. PS: Coi carries this.